We are the leading supplier of PPMS van der Pauw measurement solutions. 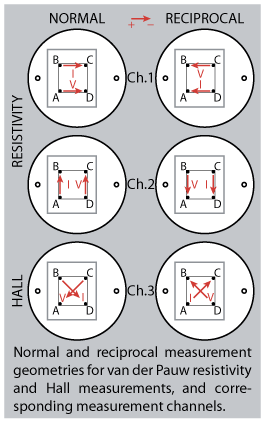 Our van der Pauw press contact assemblies make PPMS-based van der Pauw measurements of sample resistivity or Hall coefficient a breeze, correctly routing the three channels of the resistivity option or the two channels of the ac transport option to the appropriate geometry on the sample, as shown in the “normal” column of the figure to the right. Alternatively, a manually contacted sample can be set up for measurement in the same way using one of our patch boxes. 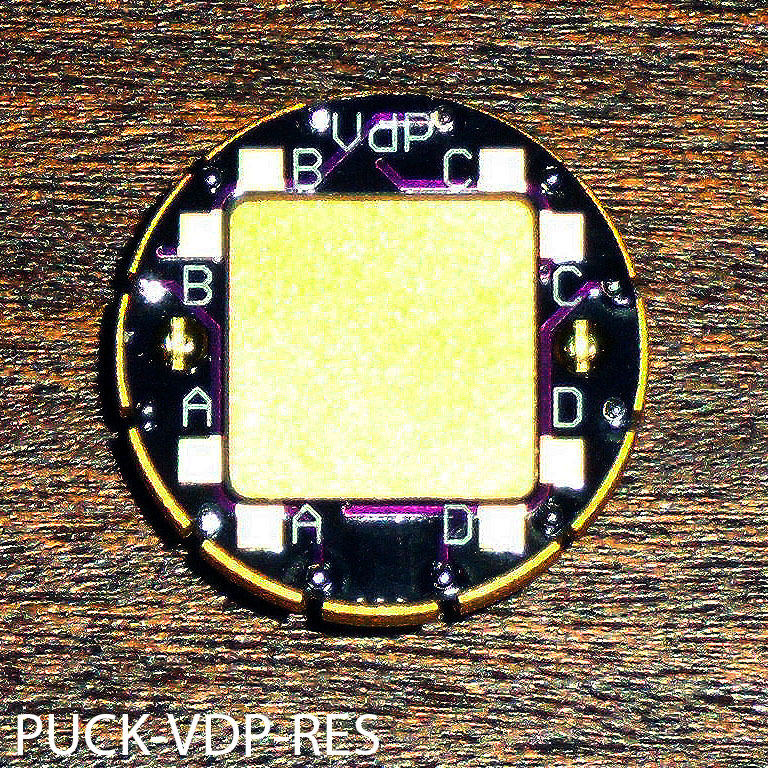 For those who wish to dedicate a sample puck to van der Pauw measurements without the use of press contacts, our van der Pauw puck overlays (below) route the appropriate connections of the available measurement channels to conveniently arranged contact areas on the puck, while providing the largest possible sample area (suitable for samples up to 13 × 13 mm) on the puck surface. Our van der Pauw rotator sample mounts provide the same functionality to the PPMS rotator. PPMS Application Note 1076-304 describes the use of the PPMS instrument for making van der Pauw measurements. A more detailed description of the method is available from NIST . In particular, note that reverse polarity measurements are easily implemented in the measurement sequence thanks to the bipolar capability of the Model 6000 / Model 7100 current source. However, a rigorous van der Pauw measurement requires the incorporation of both reverse polarity and reciprocal measurements, to cancel out erroneous effects due to an imperfectly symmetrical sample geometry. Reciprocal measurements are not so easily performed since they require alternation of the contacts, as shown in the “reciprocal” column of the figure. Our van der Pauw patch box enables this to be done manually via a set of front panel switches during measurement, without the need to remove and remount the sample. Note that our puck overlays are supplied as boards only. These must be attached to a bare puck and twelve wires soldered between the contact points on the board and the contact areas on the underside of the puck.